(NaturalNews) The genetic apocalypse we've been warning about for years may have already begun. The USDA just announced they found a significant amount of genetically engineered wheat growing in farm fields in Oregon. As the USDA announced yesterday, "...test results of plant samples from an Oregon farm indicate the presence of genetically engineered (GE) glyphosate-resistant wheat plants." Why is this a big deal? Because GE wheat has never been approved for commercialization or sale. 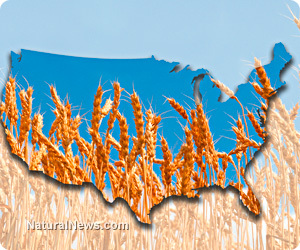 These strains of GE wheat escaped from GMO field experiments conducted across 16 states by Monsanto from 1998 to 2005. As the USDA states, "Further testing by USDA laboratories indicates the presence of the same GE glyphosate-resistant wheat variety that Monsanto was authorized to field test in 16 states from 1998 to 2005." And that means genetic pollution is already out of control. The GE wheat for which Monsanto claims patent ownership is now invading farms that never planted GE wheat. #1) Monsanto can now sue all the farms where GM wheat has been found growing. According to U.S. federal courts, those farmers have "stolen" Monsanto's intellectual property. #2) The spread of GM wheat from experimental fields to wheat production fields is proof that GMOs cause genetic pollution -- self-replicating pollution with the potential to devastate global food production. #3) All wheat produced in the United States will now be heavily scrutinized -- and possibly even rejected -- by other nations that traditionally import U.S. wheat. This obviously has enormous economic implications for U.S. farmers and agriculture. #5) U.S. consumers who eat wheat products are right now almost certainly ingesting some level of genetically modified wheat. This level may currently be very small -- perhaps even less than 1% -- but it is yet another source of GMO pollution in the food supply that could hugely impact Americans' grocery shopping decisions. Until today, Americans have been assured there are no GMOs in wheat products. They know that if you want to avoid GMOs, don't buy corn. Wheat has always been seen as a "safe haven" from genetically modified food. But now that myth has been shattered with the USDA's announcement that they found GE wheat growing in farm fields in Oregon. If they found it in Oregon, it's probably present in the 15 other states where GE wheat was openly planted in experimental fields, too. Don't worry about the safety of GE wheat, however. The USDA is absolutely sure it's completely safe for you. And why? Because Monsanto told the FDA it was safe! Oh, so the FDA "consulted" with Monsanto who told them their GE wheat was safe? I feel so much better already. Because Monsanto would never lie to the FDA about the safety of its GMOs. "We are taking this situation very seriously and have launched a formal investigation," said Michael Firko, Acting Deputy Administrator for APHIS' Biotechnology Regulatory Services, a division of the USDA. "Our first priority is to as quickly as possible determine the circumstances and extent of the situation and how it happened. We are collaborating with state, industry, and trading partners on this situation and are committed to providing timely information about our findings. USDA will put all necessary resources towards this investigation." Why is the USDA moving so quickly on this issue? Because they know the discovery of GE wheat growing in "the wild" puts the entire credibility of the U.S. wheat supply at risk. GMOs are banned in at least 27 countries around the world, and those countries will not likely allow genetically-contaminated wheat to be imported from the United States. And while this would cause a short-term flooding of cheap wheat in the U.S. market (because nobody else is buying it), the drop in price would put so many wheat farmers out of business that wheat supply would be hard hit in 2014 and beyond, and that equals long-term price increases. GMOs being found in the wheat supply, in other words, means higher food prices for all Americans. There, I was talking about corn. But apparently this was too optimistic: wheat is now being impacted, too. In that same article, I also stated, "the U.S. government is playing Russian roulette with America's food future" -- a statement that's somewhat hilarious given that Russia won't even play Russian roulette with its own crops. GMOs are a uniquely American form of corporate arrogance and genetic pollution. Nowhere in the world is agricultural imperialism so foolish yet so strongly backed by government gone bonkers. The USDA announcement all but proves these warnings to be correct: GMOs really do escape experimental fields, and they really do infect and contaminate commercial crops in North America. Those crops then become tainted and are undesirable by 90% of consumers and most developed nations around the world. By allowing GMOs to continue to be planted anywhere in North America, the U.S. government is destroying the integrity of its agricultural industries for centuries to come. Genetic pollution may never be able to be entirely removed from wheat, corn and other GM crops. And the worst part is that this genetic contamination may make these plants highly susceptible to threats that scientists have no way to anticipate or understand. While other nations around the world have exercised caution, the U.S. government conspired with Monsanto to abandon caution and risk the entire future of America's agricultural industry on quack corporate "science" that has turned out to be a genetic pollution nightmare.